Setting the industry standard for professional, courteous service; knowledgeable, problem solving staff; and efficient, careful moving professionals. Find timely, reliable service and a moving company that will stand behind every service commitment. LA Pro Moving strives to anticipate all of our customers' needs and to exceed all of their expectations in order to provide the highest quality, most worry-free move in the industry.Customer satisfaction is the key to our success. We staff our headquarters with the most qualified personnel available in the household goods moving industry. Because of this experience, we have the ability to promptly resolve problems that may occur. LA Pro Moving's system is comprised of skilled professionals providing excellent origin and destination services. Established in 1999. La Pro Moving is a relocation service company providing moving and storage services to consumers and businesses. We are committed to making each move a success. Helping a family or a business relocate is a big responsibility, requiring a team effort of continuous quality improvement, knowledge, efficiency, experience and a caring attitude. We take this responsibility very seriously, skillfully handling every step of the moving process to ensure customer satisfaction. 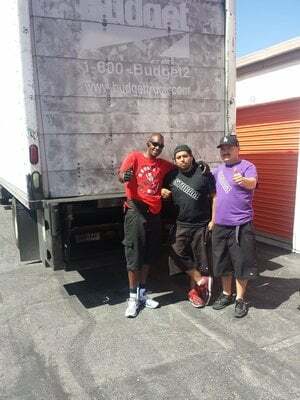 Today, LA Pro Moving is one of the most highly recommended and respected movers in Los Angeles. Wow! These guys made my move fast and fun! Super efficient and great! I was moving up a flight of stairs and they were AWESOME ! I highly recommend them and the crew of guys! The two movers arrived on time and moved my one-bedroom apartment very efficiently. They were courteous and helpful about placement of furniture. The company waived the $45 gas fee because I was just moving to the next door building. (The first company I called refused to do this.) I will certainly hire them when I have to move again. Hi guys! It was my third move per 3 years)))) And this move was the best!!! Movers arrived in time! Forman came in to my place and he explained me very professional what the will do, how much time approximately it will take. So I was wonder how professional is he! I even remember his name!!! His name is Dany and he was awesome really!!! Other 2 guys were the same! So they disassembled my furniture and all staff very quickly and loaded in the truck very fast and carefully. I watched how they worked because I was very worry about my expensive items and my very heavy glass table top!!!! But they did their job excellent!!!! 5 tars guys!!!! I appreciate!!! Just had LA Pro Moving handle my one bedroom apartment. It was an awesome move and everything was as efficient as it could be done and quick. Jerry and Joe were great to deal with and had wonderful personalities. Alberto and his crew were so great! They were fast, courteous, respectful of our stuff... And we have a LOT of stuff!! It was a very long day for them with all of our crap but they never slowed down once (even going from an elevator to just stairs in our new place). Thank you so much! I think it's a hell of a deal for the price and service.